With hard work, anyone can accomplish their goals. I know I’ve heard sayings like these over and over again. But, as I’m sure many of you know, it’s not always easy to believe the common phrases on the road to your dreams. Although we’re shown many “rags to riches” examples, we’ve also come to the realization that these “many” examples of success are really only a select few. Steve Jobs dropped out of college and started Apple in his parents’ garage. We all know how immensely successful this endeavor turned out to be, but we also know the thousands of other “Steve Jobs” whose inventions/ideas never took off. J.K. Rowling was on welfare and worked in coffee shops to keep warm before she became a best-selling author. Her story is amazing, but there are millions of other writers who can’t even get an agent or publisher to look their way. Ralph Lauren dropped out of high school and joined the army years before becoming the designer of one of the most popular name brand clothing today. Yet, I’m sure you’ve met (or have seen) many aspiring fashion designers whose clothing line ideas never manifest. Oprah’s rags to riches story is truly inspiring, yet I’ve met many inspiring journalists who never make it past reporting for the local newspaper in a small town. And I’ve come to add another to the list. The iconic, inspirational and literary genius, Dr. Maya Angelou, passed away May 28, 2014, at the age of 86. And like so many others, Angelou has a tale of overcoming triumph and adversity to reach the many feats she did in her lifetime. As I pondered Dr. Angelou’s legacy and the impact of her passing, I realized that she, like the others listed above, truly is an example of hard work and nothing being impossible to accomplish. Of course 1) success is subjective and 2) there are numerous other stories that we don’t hear about because they aren’t on the “celebrity” scale. But I believe we can learn valuable lessons when looking at the stories of Angelou and many others who seem to be the “cream of the crop” when it comes to overcoming adversity. I’ve heard may people say, “Well, those stories aren’t true for the average American.” Well, perhaps if we change our perspective, the prominent rags to riches tales can go from the minority to the majority. She was raped by her mother’s boyfriend at age seven and turned mute for the following five years. She dropped out of high school, and then later returned to graduate while being pregnant (and eventually a single-parent mother). We’re constantly taught that one must receive an education to be successful. On paper and credential wise, Angelou didn’t fit the bill for America’s definition of a future successful person. She worked as a streetcar conductor (the first black woman to do so in San Francisco), a waitress, a Madame for prostitutes and she did drugs (including smoking pot). So Angelou was a minimally educated, job hopping, teenage mother who dabbled in drugs. From the outside looking in, I’m sure no one would classify her as the recipe for success. And, which I feel is very important to note, Angelou grew up and worked in a time (the 60s) where African-Americans (including writers) were heavily oppressed. But even though everything “on paper” deemed Angelou unqualified for future success, she went on to become one of the most influential writers and voices in our nation’s history. She was fluent in six languages, received more than 30 honorary degrees and was the second poet in history to recite a poem at a presidential inauguration, among her many writing accolades. She never even earned a Ph.D. but was widely known (and preferred being referred to) as Dr. Angelou. Her life is a true testament to there being more than one road to success; Angelou paved her own road and her legacy demonstrates to us that we can too. I know it sounds cliché, but when you look at stories like Dr. Maya Angelou’s you really can see that nothing is impossible. Her life and the lives of other prominent rags to riches figures may seem like special cases, but that is only because we continue to view them that way. Dr. Angelou didn’t have many examples of black women writers while growing up, but did that stop her from writing? Our world hadn’t even fathomed the idea of an “internet” but did the lack of example stop Bill Gates? The well-known success stories shouldn’t be viewed as “special” or “rare” but as POSSIBLE. 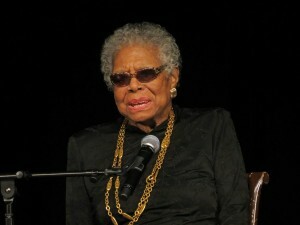 Angelou and many others show us that it is possible. You can start from nothing and turn your career into something. You can be uneducated or skip college and still achieve your dreams (depending on the occupation). Your credentials can NOT add up on paper; your background may look unqualified but that doesn’t mean your future will be. I wonder what would happen if we began to believe that anything truly is possible. How a black woman writer believed that people, in 1969, could be inspired by her autobiography, “I Know Why the Caged Bird Sings.” How a college dropout believed in an invention called Apple. Or even how one man believed in equality and freedom for South Africa. I encourage you to continue her legacy and dare to dream big. Dare to work hard and accomplish your goals. Dare to believe that you can truly be anything you wish to be. And, most important, dare to embrace the truth: Nothing is impossible.